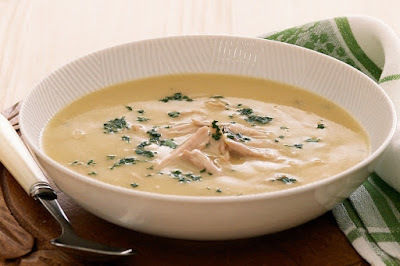 Mushroom soup is a basic and simple type of soup.Soup made with cream or milk and mushroom made are much more seasoned than the canned mixture.Mushroom soup introduce in 1934 in america as on the same date chicken with noodles also introduce.Creamy mushroom soup beaning with the new year. I generally don't make creamy mushroom soup in my home i always end up by making my family favorites- Sweet Corn Soup for the first time made mushroom soup.. I searched many online recipes but i could't make up mind.Then i found on Wikipedia in a simple and easy method then i followed it step by step method and it was so yummy more i thought. Heat a non stick with butter on a medium heat. After butter get melts add mushroom caps and saute this for three minutes on medium low heat. After three minutes add chicken stock,salt,pepper and dried parsley. Brings this to a boil.Once it come to boil on medium high heat and let it simmer for the next ten minutes. Lets go on head to add egg yolks into the half cup heavy cream. At this the simplest simmer for 10 minutes now it's time to end the half and half egg yolks. For the right quantity turn the heat on a medium high. And wait till the soup almost boil but not quite then it's time to serve.